Film still from "Below 0°"
Below 0° is an animated short film by Itai Hagage and Jonathan Gomez that follows the daily routine of Vladimir Kozlov, a meteorologist who has held a solitary research post in the Arctic for over 20 years. Though the film is a fictional account, the work offers viewers a realistic interpretation of the lone scientist’s life. 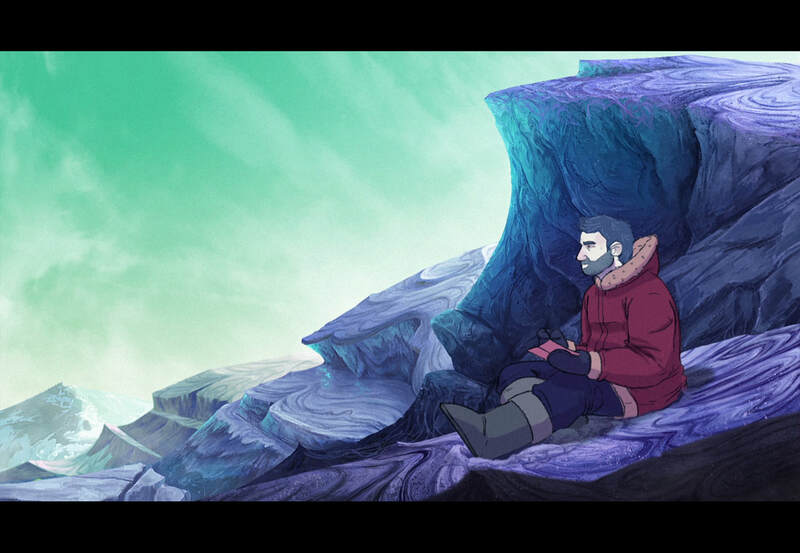 As the narrator, Kozlov reflects on his time spent in the Arctic, and the film’s striking animated visuals illustrate these reflections. The film is set in the 1950’s, marking the post-war cultural shift towards heightened consumerism and production that is now known to be inextricably linked to the Earth’s melting polar ice caps. Viewers follow Kozlov on his daily trek by foot, ski, and boat through the vast and harsh arctic tundra. The landscapes are topographically varied and include glaciers, icebergs, and ruggedly carved snow-capped mountains. It is through Kozlov’s narration that we learn of the researcher’s deep connection - which he likens to an addiction - to this landscape. While this environmental context may seem foreign to most, Kozlov demonstrates an intimate knowledge that has been gained through his decades of research. ​Elements of the landscape are personified in the film, with Kozlov describing, “I know the secrets of the soul that concern the landscape, I know what torments, what saddens, and what consoles.” Despite his isolation, the meteorologist seems to find solace and company amongst the elements of this environment. The personification in the film draws on notions of empathy for nature and blurs the line between human and non-human entities. 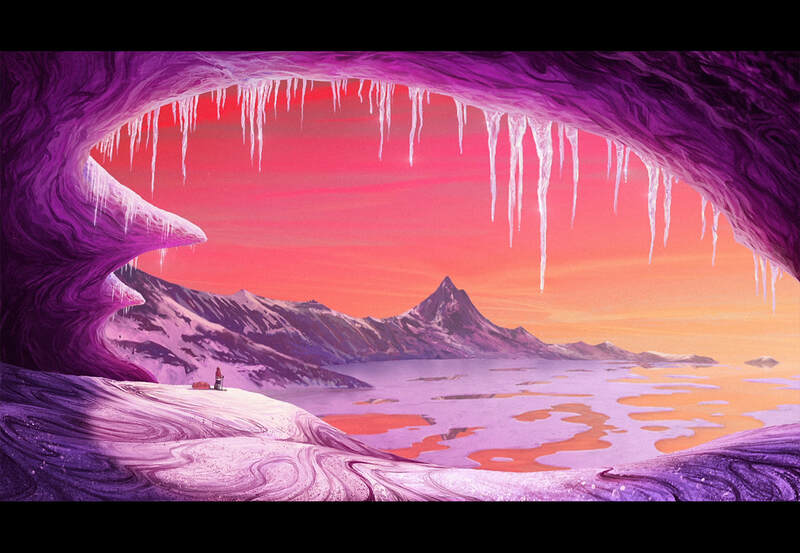 Visually the film begins with a somewhat bleak setting, however, the Arctic transforms through the course of the film into a vibrant landscape of striking colors and textures. 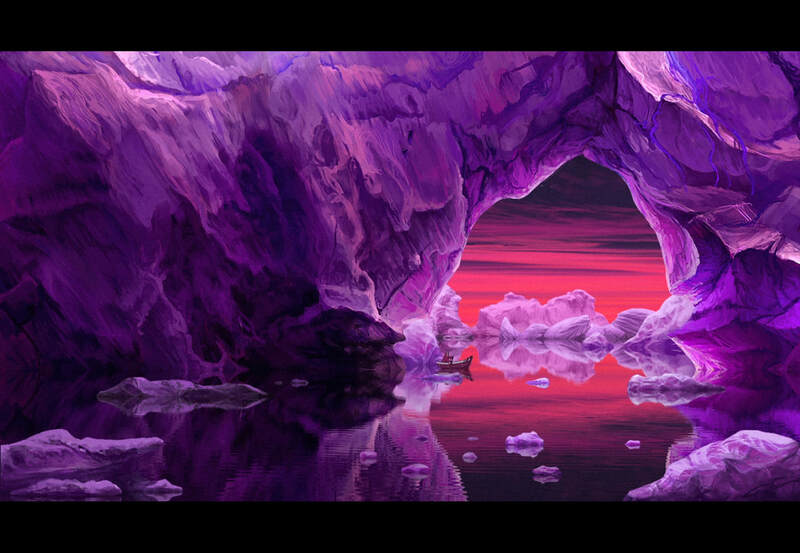 The range of hues used in the animation reveals vibrancy beyond the monochromatic icy whites and grays so typically associated with frozen landscapes. The constantly shifting scenery demonstrates the dynamic seasonality and ephemerality of a terrain that is completely shaped and molded by ice. Below 0° shows the potential of scientific field notes to create evocative narratives with reference to research work, and paints a more complete picture of the relation between science and humanity. Science can often be misunderstood as solely objective data sets and sterile laboratories, but the film champions the idea that research can also have poetic and personally expressive results. It is through this understanding of science that we can begin to draw a greater empathy for the non-human natural world in order to better preserve the landscapes and ecosystems that we are undeniably reliant upon and connected to. Below 0° is available to view through Labocine, a digital film library featuring over 1,500 film titles by an international range of artists, scientists, and filmmakers. Become a Labocine subscriber for full access to their monthly issues.